There have previously been a number of local authorities responsible for the Hammersmith and Fulham area. The current local authority was first elected in 1964, a year before formally coming into its powers and prior to the creation of the London Borough of Hammersmith on 1 April 1965. Hammersmith London Borough Council replaced Hammersmith Metropolitan Borough Council and Fulham Metropolitan Borough Council. Both had been created in 1900, replacing parish vestries. 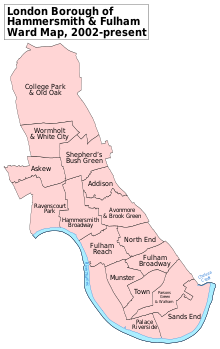 Fulham was an ancient parish covering broadly the same area as the current borough. Hammersmith was governed by a separate vestry from 1631 and was formally split off as a separate civil parish in 1834. They were joined for local government from 1855 to 1886 as the Fulham District of the Metropolis, governed by the Fulham District Board of Works. It was envisaged through the London Government Act 1963 that Hammersmith as a London local authority would share power with the Greater London Council. The split of powers and functions meant that the Greater London Council was responsible for "wide area" services such as fire, ambulance, flood prevention, and refuse disposal; with the local authorities responsible for "personal" services such as social care, libraries, cemeteries and refuse collection. The council was renamed on 1 January 1979. The two tier arrangement lasted until 1986 when Hammersmith and Fulham London Borough Council gained responsibility for some services that had been provided by the Greater London Council, such as waste disposal. Hammersmith and Fulham became an education authority in 1990. Since 2000 the Greater London Authority has taken some responsibility for highways and planning control from the council, but within the English local government system the council remains a "most purpose" authority in terms of the available range of powers and functions. Hammersmith and Fulham London Borough Council is the billing authority for Council Tax, and collects a precepts on behalf of the Mayor's Office for Policing and Crime, the London Fire and Emergency Planning Authority the Greater London Authority and Transport for London. ^ "Local elections: Hammersmith & Fulham". BBC News Online. Retrieved 16 October 2009.